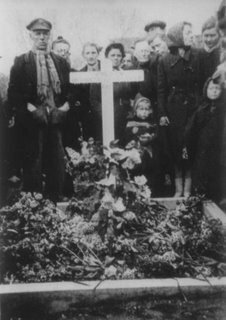 This photograph shows the service held for the six British Airmen buried at Molenaarsgraaf, Netherlands on the Dutch Liberation Day on 4 May 1945. It is one of a series of photographs taken during the service and sent to Mrs Selina Blair, widow of one of the airmen a couple of years after the war together with an eye witness account of the events at Molenaarsgraaf in May 1944 and May 1945. On the night of 21 / 22 May 1944, a Lancaster ND559 was shot down over the village while returning from a bombing mission to Duisburg. Six British airmen lost their lives and were buried in the village churchyard. These airmen were Squadron Leader Jack Blair, Sergeant J.T.E. McCaffery, Flight Sergeant E.E.E. Roberts and Flight Sergeant R.G. Watts. The pilot, Flight Sergeant William Ward survived the crash and spent the rest of the war as a POW. 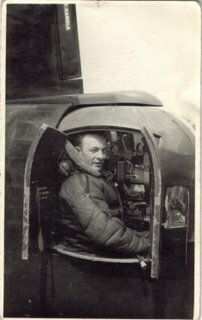 The German Nightfighter pilot who shot down the Lancaster ND 559 that crashed at Molenaarsgraaf was Hauptman Martin Drewes and the Burgomaster of Molenaarsgraaf at the time of the plane crash was Mr D. Brouwer. After the bodies of the dead airmen had been identified and inspected by the German authorities on 22 May 1944 the German Town Major from Dordrecht said that they should be buried by the villagers, but no coffins should be used and no crosses or flowers were to be placed on the graves. However, the Burgomaster asked the men of the villagers to make six wooden coffins and a wooden cross. Working through the night the coffins and cross were made and the airmen were laid to rest with due respect, and flowers were placed on the grave. The Burgomaster and other villagers later wrote to the bereaved families of the six airmen and explained what had happened to their loved ones. I have been allowed to read through the letters sent to Mrs Selina Blair, who passed away in December 2005 more than 60 years after thr war. What follows is a brief summary I have made from this correspondence. On the day the Dutch were liberated from the Germans in May 1945, the Burgomaster led the villagers to the Churchyard, together with some Allied soldiers who had been hidden for several weeks following the Arnhem Operation. Virtually all the villagers attended the funeral service. Large bouquets of flowers were placed on the grave. At last, after almost a year, due respect could be given to these airmen. Each year since the end of the Second World War, on 4 May, Dutch Liberation Day, the six airmen who lie at rest at Molenaarsgraaf are remembered and honoured for their sacrifice. Their crewmate, Flight Sergeant William Ward, visited the village and the graves of his crewmates after the war. He came from the Walsall area. After it was discovered he had survived and become a POW, Flight Sergeant Ward’s mother wrote to the families of some of his crewmates to give them the little information she knew via correspondence received via the Red Cross. This was a magnificent gesture, much appreciated by the other families. The events that took place at Molenaarsgraaf, Netherlands are worthy of remembrance. The six airmen laid to rest in the village will long be remembered, as should the efforts of the villagers to give these men a fitting and respectful funeral. This is a photograph of Squadron Leader John Edward Blair DFC DFM (known to family and friends as Jack). Jack and five of his RAF crewmates died while returning from a mission to Duisburg in May 1944. They were buried with the greatest respect by the villagers at Molenaarsgraaf, Netherlands, the nearest village to where their aircraft crashed. That remains their final resting place, with the Commonwealth War Graves Commission providing headstones after the war. In addition to Jack Blair, the other five airmen who were buried at Molenaarsgraaf were: Sergeant J.T.E. McCaffery, Flight Sergeant E.E.E. Roberts and Flight Sergeant R.G. Watts. One of the crew, Flight Sergeant William Ward, was thrown out of the aircraft before it crashed and landed alive, but wounded, with the aid of his parachute. While acting as a volunteer for the BBC CSV Action Desks to post stories to the “People’s War” website, I came across the wartime history of Jack Blair and his comrades and made five separate postings. A few months after the “People’s War” project ended, I was contacted via the BBC WW2 “Message Board” by a Dutch local historian, Mr Arjan Wemmers, about the stories I had written I had posted concerning the airmen who had died at Molenaarsgraaf during the night of 21 / 22 May 1944. Mr Wemmers was able to provide me with some additional material that I have subsequently passed on to the surviving relatives of Jack Blair, who come from my home area of West Cumbria. With the Blair family’s permission, I have placed a file of documents, letters and photographs in the Cumbria County Archives for use by other researchers. I was recently asked by the BBC CSV Action Desk for one memorable story I had come across while I was a volunteer for the “People’s War” project, and I selected the story of Jack Blair and his comrades. I felt this was amongst the most remarkable accounts of WW2 that I had come across. For further information about what I told the BBC, click on ‘Comments’ below. "Not least in comradeship was the association with the 21st Tank Brigade, whose squadrons had not flinched from expending themselves in action with the Canadian Infantry, and were now withdrawn into Army reserve to rest and make good their losses." The losses to 21st Tank Brigade were 306 and 52 Tanks with another 600 wounded of which 145th R.A.C. accounted for some 42% - 12th RTR 40% - 48th RTR – 18% - I guess that is why we called them "Golden Tracks" after they had two weeks rest as to our two days at Cattolica. While serving in Austria immediately after the war – we were fast being reduced in strength as too many senior soldiers, n.c.o.’ and Officers went home as age and time expired – some of them had been with the regiment from the Indian days prior to the war and had been all through Africa and Italy. So the regiment was suffering as not too many reinforcements were available to fill out the ranks, and many territorial units had been broken up to fill the Regular Army battalions and the 16th/5th Lancers appeared to be the wrong end of the Totem Pole. When the Brigade lost the 2nd Lothians they were to be replaced by the 4th Queens Hussars for a short period. As a consequence the squadrons were at best – at quarter strength with no real troop organisation as everyone pitched in to do what had be done. I found myself in charge of a whole troop of Sherman tanks of which I knew very little as I had been trained on both Churchill Tanks for battle, and Armoured Cars at the Rieti depot after returning to duty after hospitilisation. 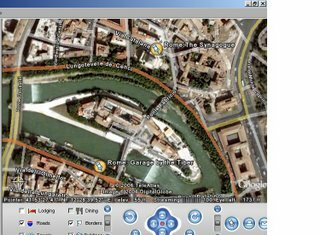 Further to Ron's "Postscript to Day Leave in Rome"
At the risk of repeating my many recommendations for GOOGLE EARTH I thought you might like to see how good the actual program is. 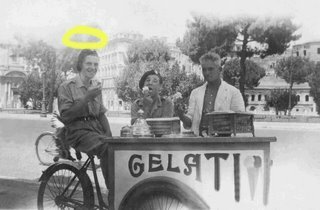 The story told of my visiting the main Synagogue, crossing the Tiber and finding a small garage that had been vandalised. Using GOOGLE EARTH I can now see most graphically the route that I took some 62 years ago. This is a photograph of the actual Victoria Cross awarded to Private James Smith of the Border Regiment who was awarded the medal for an act of gallantry on 21 December 1914 alongside his comrade Private Abraham Acton VC. Jimmy Smith and Abe Acton are just two of only 1355 recipients of the award since its inception during the Crimean War. Jimmy Smith’s medals, including the Victoria Cross, are held by the KORBR and Border Regiment Museum at Carlisle, Cumbria. In 2006, to commemorate the 150th Anniversary of the Institution of the Victoria Cross, the Royal Mint have brought out a special edition Fifty Pence Coin Set. Additionally, at the end of June 2006 a Service of Thanksgiving was held in London. It was attended by HRH the Prince of Wales, the Duchess of Cornwall, some of the surviving Victoria Cross holders and relatives of other VC winners. 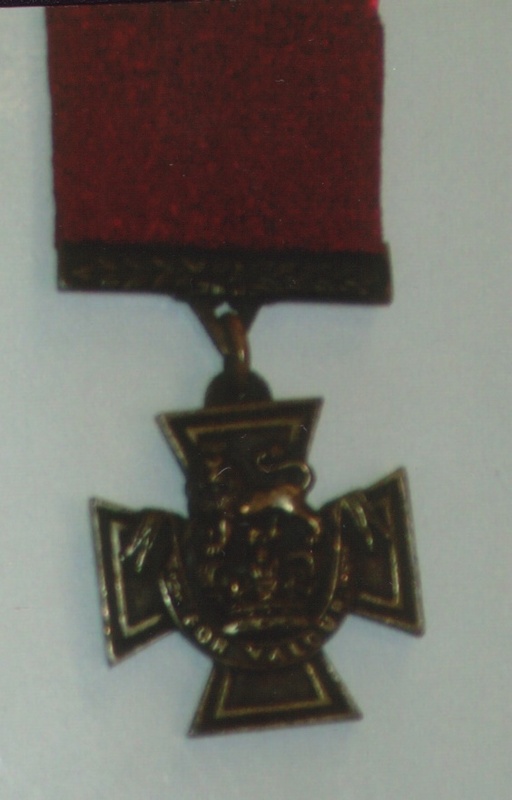 The Victoria Cross is arguably the most famous medal awarded for acts of self-sacrifice and outstanding bravery by those who have fought for their country.